We aren't actually flying out for 3 more days, but the movers are coming first thing in the morning and the computer will be first to go. I must say my goodbyes now. Goodbye Saturday morning Peng Chau basketball. Goodbye Sunday afternoon beach volleyball. Goodbye sand flies and mosquitoes. Goodbye Discovery Bay, Plaza, Discovery Bay International School, and the clubs. Goodbye Discovery Bay International Community Church and the X-Treme Sunday school class that we have taught for 3 years. Goodbye and good riddance, Park N Shop. Goodbye Seahorse Lane and Headland Drive. Goodbye LoWu, jade market, The Lanes, WanChai, and all my other fabulous shopping spots. Goodbye to fabulous holidays in Asia. Goodbye to our daughter's birthplace. Goodbye to our cherished friends in Hong Kong. I could go on and on, but I will stop because it's making me sad! It is a bittersweet time for us. We are so excited and ready to move back to America and be close to our family again, but this experience has changed us and shaped us in ways that we never could have imagined from our former lives in America. I'm not exactly sure how all of these changes and experiences will translate back into our new life in America, and I would be lying if I said I didn't have some fears about fitting back in. We've heard that it is harder to repatriate than it is to expatriate. I have a hard time believing that it could be harder moving back to my home than it was moving to China, but I know it will not come without its challenges. So be patient with me if I fill my cart at Walmart with a year's supply of CoffeeMate and Benedryl. Have mercy on me when I'm trying to juggle cleaning, 3 kids, making dinner, shopping, having a dog again, driving, and all the things I used to do but haven't done in a while. And just smack me if I am constantly referring to Hong Kong. It's just that my daily life is here now, and it may take some time to readjust to a new normal. Must get to packing now. See you all in a few days (that feels good!). All the ladies carted lunch for 25 people to the beach. Not an easy feat when you have to take a ferry, bus, and taxi to get to there! Carol and I...Carol joked when we got Maddie Rae that she would be my "surrogate sister." And that she is! She is like a sister to me, and I will miss her so much (I just said goodbye to her this morning, so I'm still liable to launch into the ugly cry). 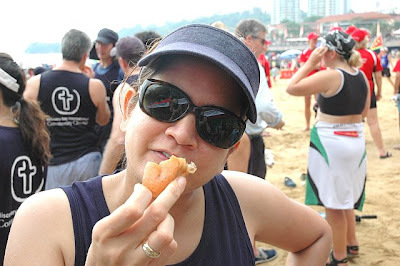 We headed out to Cheung Chau beach on Saturday for a beautiful day of sun, sand, and sausages. This was a relatively clean beach with just enough waves to allow the kids to have a lot of fun in blow up innertubes and boats. I don't think we heard from the kids for the entire 4 or 5 hours we were there! This day was in honor of sending us off, and we were so thankful for the sunny weather and good friends. I have never been more scared and sad than I was when we got on a plane to Hong Kong 3 years ago. I grew up in one house, left that house at 18 for University, and lived in that University town for the next 12 years. Moving was not on my radar...especially moving to CHINA!?! It was not always easy, but I am so thankful that we took the risk and stepped completely out of our comfort zone. God has blessed us with friends who feel like family, a daughter from China, and an understanding of Chinese culture that we would have never gained from just a short visit. We have been blessed with a wonderful church family, ministry opportunities in Mainland China, and connections with people from all over the world. Our kids have internalized China, and China is and always will be a part of us now. Today we had blue sky and puffy white clouds in Hong Kong. This happens in the summer because the winds change and blow clean air up from the South China Sea. In the winter the winds blow from the north bringing with them all the pollution. We decided to take advantage of the beautiful weather by taking a hike up one of the mountains on Lantau Island. Reminder: it's rare to see this many vibrant colors!!! This is on top of the mountain. The boys did great hiking up. Jack is an amazing hiker who never once utters a word of complaint. Jonah did well going up, but he lost steam going down the steep decline. This is a view of Victoria Harbour and Central. If you look closely, you can see the U.S.S. Ronald Reagan aircraft carrier. This is Discovery Bay right behind us, and Central HK in the background. Tsim Sha Tsui is on the left and the little island on the right is Peng Chau (where Jon and Jack go every Sat. morning to play basketball). We saw this little buddy on the way down the mountain. Jon ran and got the golf cart and thought it would be funny to put a dead snake in the back to scare us. We were scared. Until we saw this bad boy, who was alive, then we were really scared. We think it's a cobra, but we're not sure. If anyone is good at snake identification, please let us know what it is. How are the boys with the move? This is a question that keeps coming up, so I thought I would answer here how the boys feel about moving back to America. We moved to Hong Kong 4 days after Jonah's 2nd birthday and 2 months before Jack's 4th birthday. They were babies when we moved here, and now they are both school aged kids. Jonah especially has no real memory of living in America, and Jack's memories are very limited. They have both spent their summer holidays in America, so their repertoire of American life involves swimming in Mammy's pool, fishing in Nana's lake, and having nothing but fun. They both will tell you that they are very excited to move back to America and live in "the attic house." I suspect that when summer is over and "real life" starts we may have some issues. They will have to adjust to a new school, new kinds of kids, and a new atmosphere. They don't know American money and will probably often ask for 100 dollars. They only know the metric system, and have quite the little British accents (Jack especially). They call erasers "rubbers" (which could spark some interesting phone calls from school), ask their friends if they want to "have a go playing catch" (meaning, "do you want to play tag? "), and they live in the same small community here with all of their friends. It is really safe here, so they can run around with a lot of freedom riding their bikes, going to buy slurpies on their own, and playing on the beach. So while we are all more than excited to move back to America, I am somewhat sad at what they will lose: freedom, safety, friends from all over the world, thinking it's normal to go to Thailand for a long weekend, and being immersed in Chinese culture. I hope that we can somehow keep the things that we've gained from living abroad alive for them. This past weekend was really fun. We started out our weekend with a nice night out on Friday night at the Intercontinental with Brad and Carol. It's the rainy season in Southern China right now. Typhoons are all around and we get constant rain and thunderstorms. It made for some gothic looking pictures of the harbor on Friday night. It was Brad and Carol's 21st wedding anniversary. I could have been her flower girl. Hehehe. Carol and I putting our hands in Jackie Chan's handprints. The Avenue of the Stars is right outside the restaurant. Love this picture...think I will frame it. Thumbs up on the photography, Jon. Saturday was jam packed. It started for Jon at 7:15 am when his friend, Greg, met him at our door and wisked him off to "Sport's Day." Greg and Lorne, 2 of our good friends, organized a going away sport's day for Jon. They played cricket, basketball, squash, ping-pong, tennis, golf, American football, soccer, beach volleyball, and bowling. He didn't get home until 10:30 pm, and he loved every second of it! My good friend, Nadine, took Carol and I to afternoon tea at the Conrad. The cream and scones were deeeelish. Sunday was our typical go to church, go to lunch, and play beach volleyball all afternoon. Ah, we will miss those HK Sundays spent on the beach right outside our flat! We are busy wrapping up our time here and preparing for our move (which happens in 2 weeks!!). I haven't posted pics in a while, but we finally got the new lense, so I figured I would post some random things to sum up the last few weeks. I knew she was too quiet!!! She also decorated her arms and my duvet. Thankfully a new one was already in the works. Jonah had a show at school about Under the Sea. They sang songs and all had lines to recite. He did great as a newsreader reporting about sharks in the area. This is one of Jonah's best friends, Jack. Jack is from New Zealand, and when he found out that Jonah wouldn't be able to come to his birthday party, he cried for an hour. Jonah invited him to come to America to his birthday party, but I'm guessing that's not gonna happen! They have been in the same class for 2 years, and Jonah will really miss him. The boys have found a new love for all things Indiana Jones. We took them to see the movie last week and they loved it (well, Jack loved it. Jonah slept through it and said he didn't like Indiana Jones' face. I guess they weren't expecting Indy to have aged!). Jack put together this outfit and wears it all the time. He uses a belt as his bullwhip. Lookout. This is where Jon and I can be found a lot. We're in that stage where we have SO much to do, but not much of it can be done until we're home. So we sit here and look at paint colors, cars, insurance, hotels, and forms knowing that we can't really do anything for a few weeks, but feeling better just looking and trying to make decisions. Can you say, holding pattern?! This was taken yesterday after Jon's "last" day at work. They had a farewell lunch for him and gave him a really nice book. Everyone that he has worked with for the last 3 years signed it, and it was so hearfelt and lovely. He has made some lasting friends here in China who not only call him "boss" or "coworker", but more importantly "brother" and "friend." 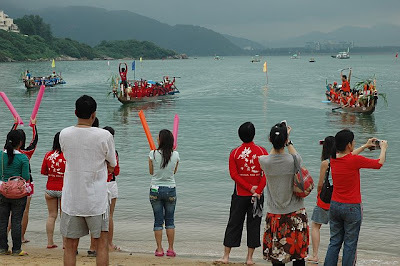 Yesterday was the Dragonboat Festival in Hong Kong. 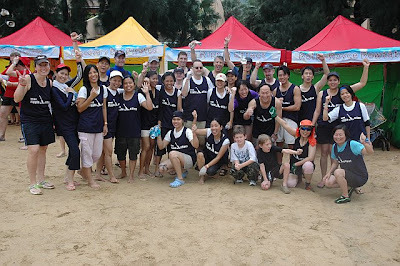 Our little community on Lantau Island holds one of the races, and our church has a team called "The Ripple Effect." Jon and I have both rowed. The first year we were here, he rowed on a very competitive team. Last year I rowed on The Ripple Effect (a not so competitive team :) And this year it was Jon's turn again. This is the view out of our friend's Martin and Sandy's flat. On a clear day (which unfortunately isn't very often) Hong Kong Island and Central are right there, but you can't see the skyline in this photo. 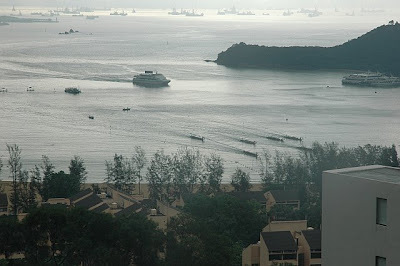 You can see the DB Ferry which takes us to Central, and in the bottom right hand corner you can see the 6 dragonboats racing. We have been having really heavy rains involving landslides and flooding, so yesterday we were just happy to have smaller amounts of rain for the festival. 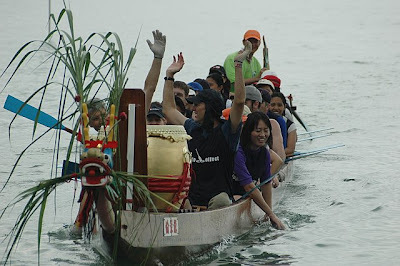 Each Dragonboat seats 20 rowers. The front is decorated with a dragon. There is a drum in the front where one person sits and drums the beat that everyone rows to. 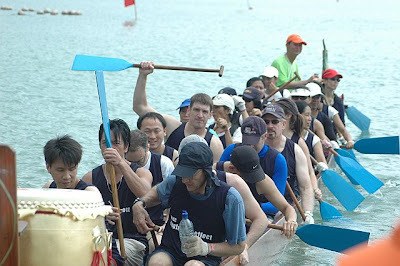 It's essential in dragonboating for the rowing to be synchronized. The man in the back "drives" the boat with the rudder. 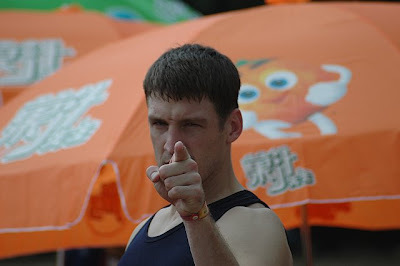 Tall white guy...that's our rower! Fans cheer on their teams on the beach. 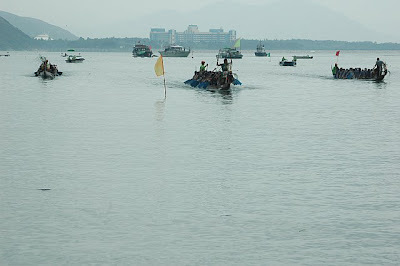 The boats load up on the beach and then they row out to the far flags. Once all the boats are there and ready, they fire the gun and the drums and rowing begin. Racing to the finish line. Sandy's enjoying the best part of the race...the Krispy Kreme donuts afterwards! I shared about 6 weeks ago about our upcoming porcelain sale, but I never did follow up on how it went. Overjoy Porcelain donated 80 boxes of beautiful hand painted porcelain to our church so that we could have a sale and donate all the proceeds to orphanages in China. Above are all the boxes as they arrived to the church. We spent almost an entire morning and afternoon unpacking and arranging the porcelain the day before the sale. Our Mom2Mom group put the sale on. Above is our group which has members from Singapore, Canada, England, Dubai, USA, South Africa, and Sweden. We're quite the multicultural bunch around here, and I will really miss that aspect of HK life when we move home. We ended up raising over $6000 USD! With the money we were able to buy many appliances and toys for Zoe's orphanage in Huazhou (see photos here) AND we are sponsoring 2 babies upcoming cleft lip surgeries at the Anhui Cleft Healing Home AND we are sponsoring the renovations on a baby room at the Cleft Healing Home AND we still have about $1500 left to hopefully go back to Huazhou in the fall and build a playroom.